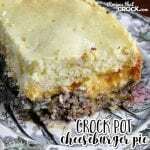 Everyone will love this easy Crock Pot Cheeseburger Pie! If you look at the oven version, you will notice that the ingredients are a tidbit different. I changed the cheese because I loved the way that it tasted with Velveeta. I also changed up the batter so that it was a little thicker and would cook up better in the crock pot (since slow cookers keep the moisture in). In case you are wondering, the paper towels catch the moisture from the lid so that it doesn't drip onto your pie.